Adding beadboard in your bathroom is a simple DIY that will cover damaged walls and instantly makeover this room in your home. Hey! The master bathroom is coming along nicely and since I’ve had a ton of questions about the beadboard that I shared on Instagram, I thought it made sense to share the full tutorial with you. When we started our bathroom makeover, one of the first things we did was to remove all the tile from the wall. While it wasn’t the world’s ugliest tile, it was pretty unattractive and certainly wasn’t giving me the coastal vibe that I was going for. We had previously done the same thing to our powder room downstairs, so I knew the tile would come down really easily with just the use of a flathead screwdriver and a hammer. I put the screwdriver to the edge of the tile and tapped with the hammer until it popped off. In fact, they came off so easily that I did the entire bathroom in an hour. I had originally debated adding a similar shiplap wall covering like we did downstairs but I was worried about the moisture from the shower either warping the wood or possible mold issues down the road. 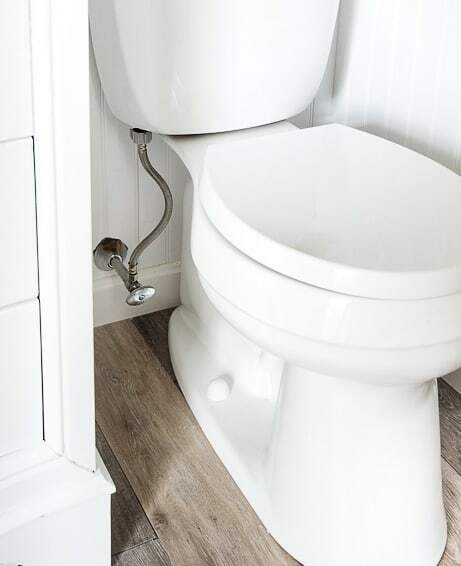 I realized that vinyl beadboard would in fact be the best product for the space since 1. it’s vinyl (no moisture issues) and 2. a beadboard wainscoting in a bathroom is as coastal as you can get! One of the reasons why I love wall coverings like beadboard, wainscoting, board & batten and shiplap is that they cover a multitude of sins. It simply was not in our budget – nor within our DIY skills – to either skim coat these damaged walls or to replace the damaged portion of the drywall completely. Like I mentioned, since this bathroom has to deal with moisture from the shower, we chose the slightly more expensive vinyl beadboard. Vinyl beadboard doesn’t have to be painted, it’s moisture resistant and can be wiped clean. Just like the vinyl plank flooring that we installed the other day, the pieces snap together. You will need a compound miter saw to get a clean cut on this, though. It’s not a score and snap kind of product. But saying that, installation on this beadboard is still very doable for the average DIYer. While there is no single standard height for installing beadboard in a bathroom, the typical height ranges from 38-to-42 inches off the ground, or taller than the vanity or sink. Our beadboard needed to reach the height of the damaged wall, so we used that as a guide. The beadboard panels were attached to the wall using some liquid nails as well and our nail gun. It all looks a little rough until it gets caulked and spackled of course. Our toilet was removed at this point since we needed it gone to install our floor. I highly recommend removing it if you chose to do this wall treatment, too, because it will be very difficult to get behind it and cut around the water line correctly if it’s there. By the way, this is where the jigsaw will come in hand to cut out a small circle or square where the water line goes. It doesn’t have to be perfect as long as it’s smaller than the little covering that slips over it. The most difficult part of the beadboard installation is the chair rail that goes along the top. Again, you’re going to need that miter saw. The inner corners are easy to miter but the outer corners need to be bevelled which was a little trickier. But again, nothing that a little caulk can’t fix! Any imperfections in cutting magically disappear once they are caulked! And now my small bathroom has beautiful beadboard walls that completely covers all the damage beneath it! This is such a great way to hide bad walls, right? 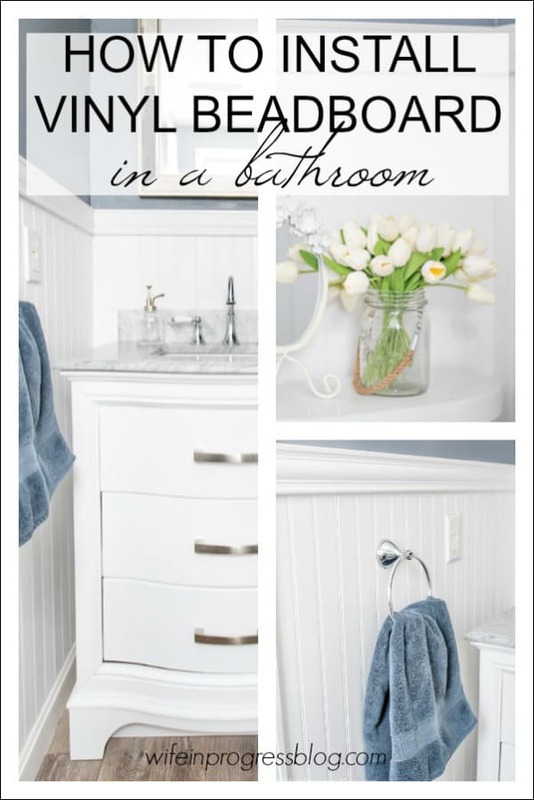 I hope this tutorial on how to install beadboard in a bathroom was helpful. If you’re looking for other inexpensive wall covering ideas be sure to read these other tutorials and don’t forget to check out the Master Bathroom Reveal! What is the color if the paint you used?